Romania’s soldier modernisation programme (SMP), the Romanian Individual Fighting System (RIFS) will move onto prototyping with a functional demonstrator stage during 2009, according to Major Tiberious Tomoiaga, RIFS Programme Manager at the country’s Military Equipments and Technologies Research Agency. “Right now our programme is in the refining phase. We are now are trying operational capabilities and concept refining. We developed our models, based on results from a number of connected projects,” explained Major Tomoiaga. 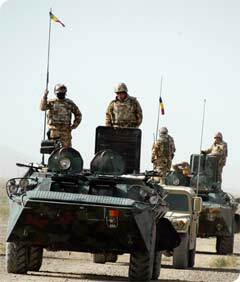 At a concept level, Romania is working with two variants. The first – Variant A – is the most complex and comprises six subsystems: Weapon, Integrated Helmet, Computer and Communication, Carriage and Protection and Power and a further Support Subsystem, which provided virtual support providing input for UAVs, UGVs and other off board information, considered integral to future operations. The Support subsystem uses Quantum 3D’s ExpeditionDI, based around the Thermite tactical computer. “Right now, we have developed a software application for this subsystem to train the full squad of nine members. The system actually looks similar to the future soldier system – a computer with motion sensors on the head, body, arms and weapon.” Romania is collaborating with Bohemia Interactive Australia to provide the virtual trainer’s software to simulate various missions, sensors and different urban environments. A functional demonstrator will be used in the prototyping phase. The system is typical, with integrated helmet subsystem with night vision and micro-display, 2.4GHZ 802.11G communications for voice and data, with the computer based around a Transmeta Crusoe, 1GHz processor and Windows XP Pro operating system. The Demonstrator’s weapon system is described as a 5.56mm ‘AK-47’ system, with red dot, laser pointer and image intensification and thermal sensor. To develop a better idea of the future capabilities required, the RIFS programme developed its own thermal sight for this phase. Weighing 1.5kg, the InSb based, 320x240 pixel sensor offers detection at 750m, recognition at 250m and 100m identification. In 2009–13 RIFS will begin its prototyping, test and evaluation and continuing research and development. In 2013 the programme is scheduled to switch to a risk reduction phase and procurement phase from 2013 with the plan being to field 500 systems.